Onychocryptosis is the medical term for the condition most of us know as an ingrown toenail. This occurs when the side of the toenail, commonly of the big toe though not always, curves in too much and slices through the skin and flesh growing into the toe. It is a very painful condition and while it may sound like a minor problem, it can have a very negative impact on your life making it hard or impossible to walk or even get on any footwear. It can happen to anyone and there are several reasons for it such as shoes that are too tight causing the toes to squeeze together, injury to the nail, or even having a naturally curved growing toenail making you more prone to them. 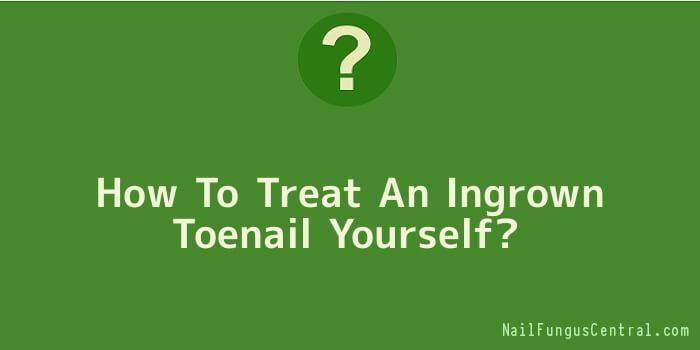 When Is It Okay To Treat An Ingrown Toenail Yourself? If none of these are okay, then it is safe for you to attempt treatment yourself, but if at any point infection does develop, or your home attempts have seen no improvement, then you should seek medical advice. Soak the affected foot in hot water with Epsom or regular salt added for twenty to thirty minutes. This is not just about cleaning the area; it also softens the nail and skin. You could also try adding in essential oils to the foot soak to help with inflammation, easing the pain and to prevent infection, lavender oil or tea tree oil for example. Roll some cotton ball into a thin wick. Using a nail file or pedicure stick ease up the nail so that it lifts as far out of the toe as you can get. Push in the cotton wick so that wedges the nail and keeps it lifted. Apply some antibiotic cream to help prevent infection and wrap the toe in bandage. Repeat the soaking another two or three times each day. Make sure you change the cotton each day to avoid infection. Keep the area as clean and dry as possible the rest of the time. If you have to wear shoes keep them loose fitting. If after three to four days the nail has not corrected itself and the wound is not healing, see a doctor.